I'm going to be honest here and say that I'm utterly exhausted this year. I think I might have said that recently in other posts...Maybe every post? I'm so exhausted that I don't even remember. It is the first year where I am following another curriculum in which I am not in control, and it makes me tired. Don't get me wrong...it does wonderful things too, such as holds me accountable and ensures that my daughter is learning the appropriate objectives for kindergarten. At this point in my homeschooling, I want direction. Even as a long-time elementary school teacher, I need direction. But the downside is that it almost feels like a race to keep up at times. 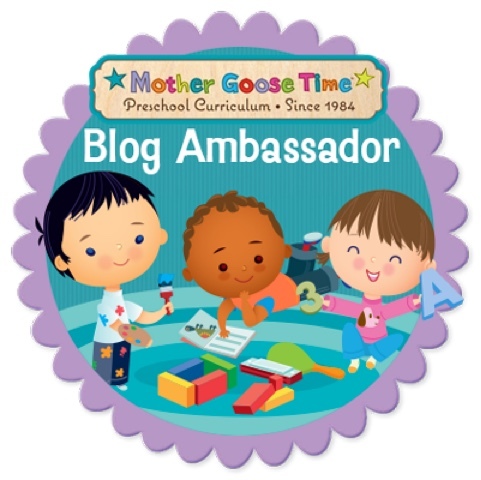 Needless to say, when I do Mother Goose Time for Strong B and even Tiny B, it is like a breath of fresh air, and I want to hold onto this time for as long as I can. I will probably be having Strong B start kindergarten the year after next instead of next year (he was a preemie as well and shouldn't start next year anyway if he had been born at the appropriate time) so my prayer is that we have this year and next year with this sweet curriculum. I can only imagine how much we will grow. I feel no pressure during my lessons with Strong B because I know that if he doesn't "get it" this month or next, he will eventually. We are going slowly and enjoying every moment. 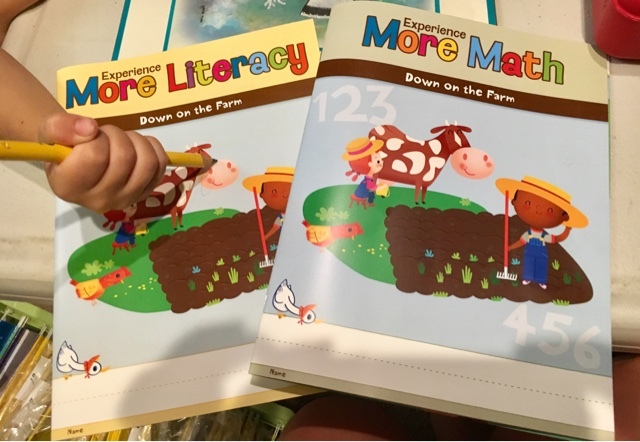 We've been using the Experience More Literacy and Math workbooks from MGT for the first time for him this month. You should have seen his face....He was so excited that it was finally his turn! Doing book work is totally new for him and he truly enjoys it. 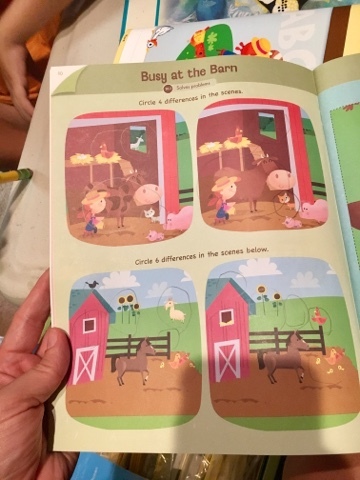 At four years-old, I feel no need to absolutely do book work, but since he is enjoying it, I see no reason not to. It helps him to even further grasp the contents that I am teaching during his MGT lessons. 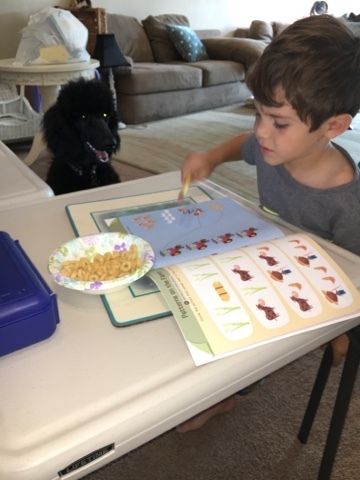 Jack the Poodle also enjoys the workbooks, obviously. 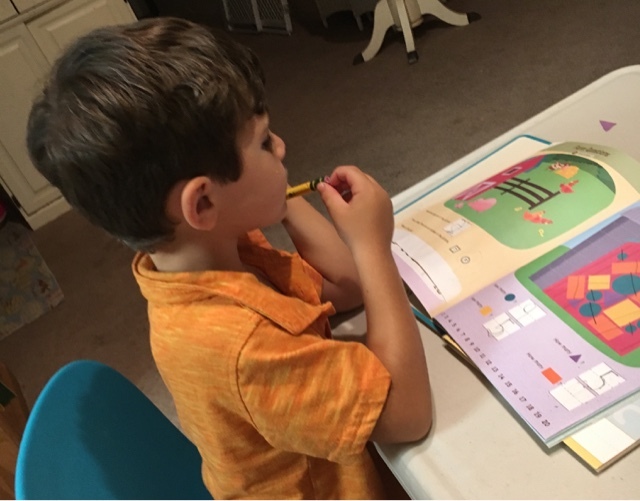 Tonight we took out the workbooks again because he wanted to, and worked on math. We counted, noticed differences, and discussed shapes. I purposefully allowed him to use this awful pencil grip for this picture so that I can be reminded for years to come as to how I tried to break him of this habit. Ugh! Oh, the sweet days of preschool and kindergarten...It's a popular saying that as a mother, the days feel so long but the years feel so short. I think it must also be true of homeschooling. It's an enormous endeavor and every day I'm reminded of the giant responsibility that I carry. I'm so tired but so confident that I'm making the right choice for our family.